This conversation between Rhizome’s preservation director, Dragan Espenschied, and Vint Cerf, Vice President and Chief Internet Evangelist for Google, took place in London in April 2017 at a convening that marked the beginning of a new partnership between Rhizome and Google Cultural Institute. Vint Cerf: I want to start by pointing out that preservation by accident is not a plan. That is, in fact, how an awful lot of artifacts have been preserved: because somebody kept them by happenstance. They were stored in a place that was preserved, like manuscripts stored in a cave in Qumran, for instance, over thousands of years. In the digital case though, the artifacts that we create require a substantial infrastructure in order to be rendered in a useful way. We need help to present those objects to our senses, and the ability to preserve all of that infrastructure is a big challenge, so the persistence of our ability to make these objects accessible, whether they're text documents, or works of art, or performance music, or other kinds of performance art, is a big issue. That’s why I think that Dragan’s focus on tools for preservation is such an important idea. We don’t know what should be preserved, we don’t know who will want to preserve something, but we want them to have tools to do that if they wish to do so, and not be bereft of that. Dragan Espenschied: I’m glad to be sitting here with Vint who, of course, has enabled Internet* art, but has also caused all the trouble for Internet art at the same time. As Internet art is inherently performative, and made with the network in mind, as a condition, we have to…well, what I like to think about is its performative staying power. It is like a ritual, or a repertoire, that an institution is collecting. But instead of objects that are taken out of cold storage, and put on a wall, [the works] have to be re-performed in order to keep their cultural value and to keep their power. I want to show you an artwork that we have recently presented in the Net Art Anthology, called The Web Stalker by I/O/D, which is a browser made by artists in 1997. VC: That sounds vaguely threatening. Why is it called The Web Stalker? DE: At that time it was fine. At that time, there were only nice people on the Internet. So this is how this is presented, this 1997 project, in Windows 98. With Emulation as a Service, we were able to run that original software environment. We can also, then, launch that artifact. There’s no sound connected here, but there’s the Windows boot-up sound as well. The interaction with that system changes, because users don’t necessarily have a mouse anymore, so we were forced to write instructions here, for how to use the thing if you don’t have a mouse. Many users also don’t know how to right click, because it’s really not required anymore. VC: This is great, including all the crappy graphics. It’s amazing. DE: Here, I have to put a URL in the crawler. This is where it gets interesting, because of course you also need the Internet for this thing to work. It’s an alternative browser after all. It walks around the web, and surfs by itself, creating a map of what it finds. You can also change the background color. 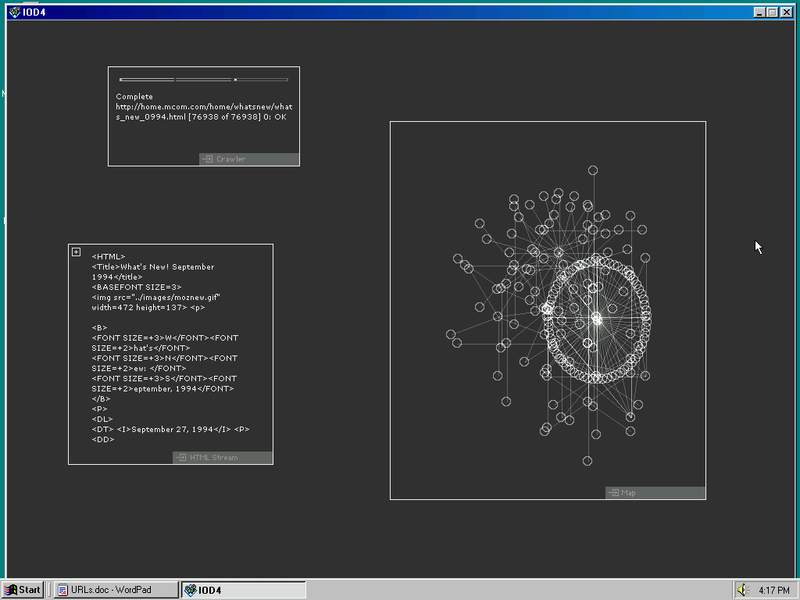 You can look at different nodes here, which usually shows you the code it is analyzing. So, it’s a structural web browser. This is already quite a nightmarish case for digital preservation. You need this operating system, and you need to understand how to operate the browser, because it just gives you a blank screen on startup. You need also websites that are still accessible by this outdated tool. We are moving, for example, to a fully encrypted web, where everything is https. This one doesn’t support https, it wasn’t very common at that time. Also even if it would support https, the encryption algorithms are changing all the time because they’re found to be insecure. So, there have to be ways to keep that going. To repeat that performance, and not just accept the static image of it. VC: So this is a good example of something that [Internet Archive founder] Brewster Kahle has been forced to do. In order to make things reproducible, when he has captured web pages and references to other web pages, he’s had to copy those web pages into his own storage system and change the URLs so that they are locally resolvable. I think that’s probably the only solution that you can have to maintain any degree of fidelity with regard to the experience of that past, especially given that web pages disappear. To offer one other interesting evolution in this whole story of preservation: what Brewster has done is build an additional feature into Chrome that you can download and add, so that if you get a “Page 404: Not Found,” it will then automatically go to the Internet Archive to see if it could find that page that might have been recorded, historically. So that’s an attempt to blend the past with the present, mechanically speaking. What faces all of us with digital preservation, is the amount of infrastructure that needs to be available in order to retain the experience. It’s significant that we need all of the assistance of all that software. Otherwise, our own senses don’t prevail. In the older artistic productions, our eyes and ears and sense of touch, and even taste maybe, are sufficient for us to experience those preserved works of art. Yet, in this new world of online and digital art, we need all of this additional capability before the objects are rendered and experienceable for us. So this is a huge challenge. Partly because there are costs associated with maintaining that infrastructure. Hiding behind the technology and everything else, is the question of who’s going to pay for it, and for how long? And under what conditions? DE: I want to pick up on the term “rendering,” which should be critically examined, especially if you are looking at a piece like The Web Stalker. This is not creating something that is just nice to look at, or experience with your senses; it’s also a map. The process itself is the biggest part of this artwork. Something very special about net art is that it’s not screen essentialism, what’s on your screen. There is a lot of process there, that is important. The term “rendering” has something very visual to it, and the “visual” part is very important for this piece, and for many others, but it is only one part. VC: I would argue to use the term “render” in a more general sense, as in: to produce something that is palpable. Whether it’s visual or audible, or touch, or something else. From my point of view, rendering is not merely visual. So we can expand the definition for purposes of today’s discussion. What I wanted to say about infrastructure is that this is actually something we want to build, and we have also built with some support from Google. We think about it, as you said, with a focus on tools, that is, an infrastructure can be useful for many different uses and institutions, and single users, too, so that preservation is available to a more diverse user base. That is indeed, something that needs to be kept up. There is an economic problem there. There was this artist making a performance piece on Instagram so we have one of those in our collection, but yeah, “Why don’t you just talk to Facebook, because they own Instagram, and for sure they have people that will help you.” I think there is a kind of misunderstanding in how these different things work. Is there anything you want to say about that? VC: Think of this like an institutional paintbrush. Just to create a neologism here. What we should not imagine, is that the paintbrush has anything to do with preservation. It may have something to do with production. Many of the tools people use at Google and elsewhere are like paintbrushes. We can’t assume they will confer preservability on the objects, or events, that are created. I’d like to take this conversation around to a slightly different path that has to do with the fidelity of the preservation which we are able to achieve. Some of us who have been working in this space realize that, perhaps, we can’t anticipate perfection in our ability to preserve and experience a digital object and that we may need to be satisfied with various levels of fidelity. So for example, in the case of an image, we might be able to get a bitmap of an image, but no more depth than that, as opposed to preserving the mechanism that produced the image and allow interaction with is, and maybe alteration and changing. I’ve been unhappy with the idea that I wouldn’t be able to achieve a perfect rendering and a perfect recollection of the experience. But Dragan convinced me, in a conversation we had this morning, that attempting to preserve perfectly may actually inhibit the ability to preserve anything at all, and that would not be a good outcome. DE: Yeah sure, that’s my favorite topic. For example, when we think about a performance that happens on Instagram, which is what artists are doing, and which is also not only about the images that are posted. The question is: what is really the boundary of that thing, of that performance? Or what is possible to institutionally ingest and actually work with? Of course, this thing never had any stable form, it has like an unlimited number of forms, and it can look different to everyone. Even if we have very good tools like Webrecorder to look at that performance—to artifactualize it in a way—to make it into a stable thing that can be stored, in some storage system, it will still not be the same as if you’re following that artist on Instagram while the performance is happening. Being very conscious about where you draw the boundary around it, what makes sense, is much more important than what it means to be technologically complete, in a way, because that is just unattainable. VC: Here’s an example that I resonate with, because I’m now on the board of the Folger Shakespeare Library. Think a little bit about the First Folio, 1623; what’s preserved there is text. It’s the script, and the stage direction. What’s not preserved, for example, the stage set, and what is not preserved, of course, is the actual performance. The preservation of the script is an important component, and yet the experience of Shakespeare’s plays are consequence of a performance by actors in a setting which has been chosen, typically by the director. What is interesting is the variety of renderings (if I can now use this word in a more general sense), in the renderings of Shakespeare’s plays, sometimes you see them in modern dress, sometimes there’s a very clear attempt to translate from the 17th or 16th century experience to a modern experience to draw an analogy. So I bring this up just to illustrate the challenge that’s associated with trying to preserve something as straightforward as a play, because there are so many instances of it. We don’t necessarily need to preserve all conceivable instances of a play, but we would like to be able to preserve at least some of them. That’s the simpler case than the one that we face when we’re using digital technology, in order to produce a work. Preserving, yet again, has to rely very heavily on an infrastructure, which may not, itself, be preservable over time. So I want to tickle the tool question a little bit, to say that, for a long time, I was persuaded that we were going to have to preserve the ability to emulate old hardware, to run old operating systems, to run old applications, in order to correctly render a particular application. Like a text document or an interactive game, or something else. And although I still think that is an important capability, I’m no longer persuaded that it’s the only way to deal with this problem. Another increasingly attractive solution is source code. If we can preserve enough of the infrastructure and execution environment, so we have to be able to compile, maybe recompile code. I don’t know how many of you remember the Adventure games, Zork from Infocom and so on, a lot of those have been reproduced now because the only thing you needed to do was render the text, and keep track of what all the various objects were that people were carrying around and what the topology of the game was. And that’s something you can reproduce. So a number of people have rewritten the code. One fellow Don Woods rewrote the code in Fortran at one point, which was great because then I could hack my way into a solution. I couldn’t do that with the original implementation. Preservation of source code may turn out to be a very important component of the various tools that we use, as long as we can also reproduce the compile code, and executables that are needed. For some of the interactive art—games and things like that, sometimes you need a physical component, you know, the game consoles, whether those are going to be preserved, or can be reproduced in some way, is an open question. Like, “Do we have a mouse or not?” is part of the problem. I have personal experience that I have yet to resolve. I wrote a program in Basic for an Apple IIe that my son and I did back in the early 1980s, and it was an interesting, artistic rendering that produced very pretty patterns on the screen. They were intended to be non-reproducible, or at least over a very long cycle. I still have the basic code, but I’m not sure that all the instructions for rendering the colors and everything would be correctly reproduced on any present devices. DE: You should let us have that. VC: Okay, I’ll have to dig it out. It’s literally on a piece of paper, sitting in my filing cabinet somewhere. And I would love to reproduce that, because it was actually a very interesting thing you could stare for a long time at. It was better than taking LSD (not that I’ve ever tried that). So we’re seeing various kinds of things that should be in our toolkits, to enable people to preserve these various kinds of work. DE: I think what would be interesting is to show a structured approach to using emulations, so that it becomes less of a…mountain that you think you have to climb, and rather something very nice, prepackaged and conceived. I would also like to talk about a cultural scale of that whole field, because you can invest in source code, and I’m all for it. Everyone in the preservation field tries to use software that is available with its source code, but there is also a lot of knowledge that needs to be kept around for working with source code. VC: —all of the surrounding environment. DE: All of the surrounding things! And to have the source code, for example, Windows 98, even Microsoft didn’t understand Windows 98, obviously. How can an artist even dream of understanding it? It’s the same problem with knowledge as it is with infrastructure. I can ask Facebook, can you give me a copy of your data, and then I just have to build my own data center. And if I’m working on the source code level, I have to—in the same way—I need all the knowledge, all the tricks. I need to know how you compile everything and what is the exact version of each library, and that is also a huge burden. VC: Let me try an idea out on you. This is almost going to sound philistine, so I run some risk. Artists figure out ways to produce art in the most incredible, unexpected ways. They are metallurgists and chemists and programmers and everything else. But you used a term in our earlier conversation, it was “stable form.” The idea of a stable form, for a work of art, is a really interesting one for me. It doesn’t mean that the artwork is static, it simply means it is reproducible. So, this notion of stable form is very attractive. The point is, there is a great deal of infrastructure required to reproduce some of these works. Maybe we should be thinking: how can we offer the artist tools for art production, not for preservation, but for production, which have an implicit stable form capability in them? This may limit the set of things that they can produce, which will be preservable, but we could at least say something about the preservability of art produced using this particular set of tools, that produce stable forms. I think we should keep that in mind as we start thinking about helping the artists of the world produce art, which is preservable over a period of time. DE: They will definitely not do it. VC: Well, no one is dictating anything here, but if you believe, as I do, that the historical view of civilizations, and societies has been largely dictated by art, which has survived—we don’t know as much about history until writing becomes part of history. We know very little about the social activities of a lot of our early ancestors, but we see bits and pieces from their art. Like the ones that you showed on the presentation on the wall, art forms from 50,000 years ago. So, in some sense, we are doing history a favor by trying to provide these kinds of stable forms, that will allow it to last for a while, and therefore say something about our society. Some of you will know about a book called A Team of Rivals, by Doris Kearns Goodwin. It was about Abraham Lincoln and the formation of his cabinet, which was made up of people who were his opponents during the presidential election, and that is why the book is called A Team of Rivals. What’s interesting is Doris Kearns Goodwin reproduces the dialogue of the day in a very incredible way. The question is: how did she do that? The answer is, she went to the libraries of the written letters amongst these various principles and then reproduced credible dialogue on the topics, and the words used by them, so the book has this gravitas because of that. I wonder about the 22nd-century Doris Kearns Goodwin, who tries to reproduce the dialogue of our time, lacking access to the emails, the blogs, the tweets, and all the other things that we create in a digital environment, which may be lost because no one is paying attention to preservation. Both on the technical side, and also on the financial, and maybe legal side. So collectively, we have a big challenge ahead of us if we want our descendants to understand anything about our current culture, given that it so laced with online environments. DE: Maybe I can tell a little anecdote about a class I once taught. I was invited to teach a class at NYU about emulation, and how to work with preservation, very introductory for art students. I said, “Today, we will run Windows 98.” If you think I’m totally hooked on Windows 98, it’s kind of true. They were super excited, most of them were computer literate, more or less, for what they need to do, but not for emulation, and I had to give them serial numbers to track Windows 98 and so on, and so forth. They really wanted to do it, they wanted to solve their problems, some of them didn’t know, if they download a file, where it ends up on their computer, but in the end they all had the emulator running and then they wanted to know "where is Microsoft Paint?" Then I showed them here, then the start menu, then you go here, in there, in there, it’s like you’re playing this game with the hot wire and then you click on Microsoft Paint. Then, they started to draw in Microsoft Paint, and make pictures of the screen, and posted them on Instagram. In Internet culture, Microsoft Paint is an incredible piece of software. It symbolizes so much, because even if you work at an insurance company, or at a bank, where your computer is totally locked down, you could still do art because Microsoft Paint would be on it. It was irremovable because it’s part of the operating system. So it had an aura. There is so much embedded in that thing, and if you treat it like a ritual, like a repertoire, it is knowledge through repetition. This is not for a 50,000-year scale, this is for a ten-year scale. I think we have to scale up slowly on that level, and maybe we’ll go to the fifteen-year scale next time. VC: I’m concerned about hundreds of years, though. Someone will say well, all that crap on the net doesn’t deserve to be preserved for five hundred years, and that I would actually agree with that. On the other hand, there are some things that people would like to preserve and we should give them the tools to do that, even if no one else cares about that. At least it should be possible to do that. I wonder if I could steer in a very different direction for just a moment, because once we introduce computing and software into our world of art, we have an incredibly versatile tool for doing a wide range of things. I mean, we haven’t even gotten to 3D printing, for example, which is a whole other space in which to produce objects, some of which could be considered artistic. Think for just a minute about software which uses artificial intelligence and machine learning, to try to discern style: a music work, or maybe an artistic work, or maybe even a written work. Suppose that we get good enough to extract the essence of Bach, or Beethoven, or Shakespeare for that matter, to generate works that closely emulate the style of that artist. What should we make of those things? What will happen, is that counterfeit art? Does it have significance even if it wasn’t made by the original artist? I don’t quite know what to do about that, but I suspect we’re going to get more and more situations like that. I don’t understand how we classify stuff like that. Is it a derivative work, or does copyright not have anything to say at all about what this means? DE: I think that is funny because, especially Internet artists have, since forever, generated such work. They have created systems, or game creators, or any artist, that works with software not to create a static object. They have created systems, basically, there is not one thing you could say this is the canonical version of that piece. But it’s all about encounters that are different each time. I think they have already figured it out, and some of them have managed to build a career on it. VC: Until you mention the artist creating the system to produce things, for those you for whom mathematics is a reasonable language, there are functions, you know like “f of x” is some number, and then there are functionals. Functionals produce functions. So that’s the analog here, producing the system, which produces art. If you’re the artist using the system, and you set up a bunch of parameters, it produces art of a certain kind, whether it’s visual or audible or something else. If I set the parameters, they’re Vint Cerf parameters and they produce Vint Cerf’s style of art, as opposed to Dragan’s style of art. At that point, we have a cascade of artistry, and now there’s a question about who owns what. This is sort of like does Microsoft get to claim rights in anything anybody wrote with Microsoft Word? I think the decision is that they don’t. If you have an archive that’s trying to preserve a lot of the artifacts that are needed in order to render the art, do you have the rights to do it? Do we have a legal infrastructure that supports that? Is that going to be international, or is it going to have to be instantiated on a national basis everywhere? I don’t have answers to all those questions, but we have to find answers to them if we expect to make the tools that Dragan wants to have available, actually work for people. DE: I think this also falls back into this question of how completely do you even have to think things through before you act? For example, we have put that Microsoft operating system online, and we’ve had zero trouble from it. I’m sure Microsoft knows about it, but what should they do? It’s a beautiful artwork, why should they have it removed? I feel the same about a 50,000-year time scale actually. If we are waiting until we have a good idea on how to preserve something for 50,000 years, but we can’t prove it now, because we won’t live 50,000 years to see if that is actually true, I would rather preserve something for fifty months. I would rather invent a process, and do that now, and try to increase an artifact's lifespan, than look back and see what works, and what does not work. *The transcript was edited by the participants and reflects their preferred terminology and capitalization.